How to start an animal id program that works. Veterinarians tell us how important it is to be consistent: to get a TabBand collar on each animal the moment it arrives. The TabBand collar reassures clients that you won't make a mistake, tells them their pet is in good hands. "We make a show of it," says Sharon DeNayer, Practice Manager of Windsor Veterinary Clinic in Colorado. "It’s important for people to know that we’re doing everything possible to keep their pets safe while they’re here." That's the kind of approach that earned Sharon the Practice Manager of the Year Award from Veterinary Economics, Firstline and the Veterinary Hospital Managers Association. The system works for animal hospitals, kennels, or groomers. Prepare TabBand collars the day before scheduled appointments, clipping one to each customer sheet. That way there's no delay during the morning rush. Take the animal's permanent collar off and hand it to the owner so it won't get lost. Write the name of the owner on the collar, along with other information you find helpful, such as the procedure or the name of the animal. 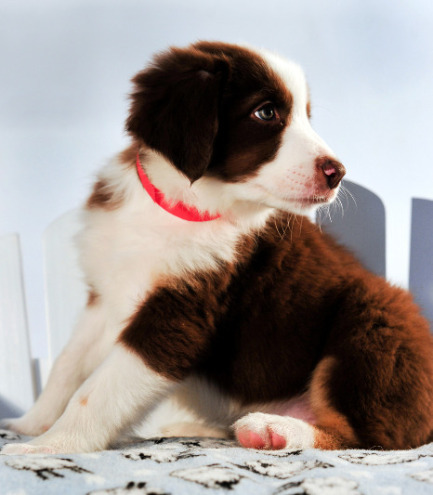 Since TabBand Max collars come in seven colors (including white), you can code animals for different purposes—say, green for neutering or red for boarding. Kennels and breeders often mark females with pink and males with blue. TabBand Max collars come in 10- and 20-inch lengths. You can stock both sizes or, to keep things simple, just use the 20-inchers, since they can be trimmed to fit. If you have a big, shaggy dog to mark, it’s easy to fasten two bands together. If you're just beginning to use TabBand collars, it's essential to have the staff understand why you're doing it. It's too easy to let things slide back to the old way of doing things. Consultant Dr. David Goodnight suggests, "Have the doctor schedule a staff meeting and communicate and discuss [TabBand] use as a real need and benefit to the pet and clients. If everyone buys into it, the chances are better that the system will succeed." "There's an adage that says, don't expect what you do not inspect," writes consultant Mark Opperman. "I was an administrator for a 14-doctor, 52-employee hospital. We required all patients to have an ID band on them. Guess what I did!" After a while, everyone will be watching for TabBand collars and the system will become a good habit. TabBand collars can help you avoid some terrible mistakes. Face it, we're not perfect. As Dr. Larry Neiman put it brutally, "I wouldn't operate without them. Somebody is going to screw up." That's why organizations such as the American Animal Hospital Association (AAHA) and the American Veterinary Medicine Association (AVMA) Professional Liability Insurance Trust call for positive animal identification. As AAHA’s Deborah Gadomski says, ID bands are an easy way to meet that requirement. Dr. Goodnight says he thinks any animal separated from its owner needs a band, even if dropped off for an hour or less. TabBand identification has been in business since 1962, so you can imagine how many conversations we've had with veterinarians and other animal professionals. We meet hundreds at every conference we attend and we try to ask questions and listen as much as we explain our products. Some of those conversations are burned into our memories. We'll never forget the look in the eyes of an owner whose clinic slipped up and returned nearly identical dogs to the wrong owners. "I called and said don't even open the door! Don't let it out!" Then she jumped in her car. "I rushed over, my heart was racing!" That clinic is using TabBand collars today, but believe it or not some people just don't get the message. A technician stopped to talk with us at the Western Veterinary Conference, shaking her head in disgust. "There was a huge scene in the waiting room just last week. Two people said they had the wrong cat! But will anybody do anything? Will they use TabBands? Nope! What’ll it take?!!" Mark Opperman is afraid he knows the answer. "Unfortunately, it might take one mistake to realize how important ID bands are." © Copyright 20165 Ampro Group LLC. All Rights Reserved.